Root canal therapy is a conservative treatment that can eliminate painful symptoms of an infected tooth and prevent the other teeth from being infected without an invasive tooth extraction. This treatment can become necessary when a tooth has been damaged from trauma or infection too severely for a tooth-colored filling or dental crown. Once the roots of a tooth are compromised, the only forms of treatment include extraction or root canal therapy. Because he prefers to save natural tissue, Dr. Jon Marc Van Slate will recommend a root canal instead of extraction whenever possible at our Houston, TX, dental practice. 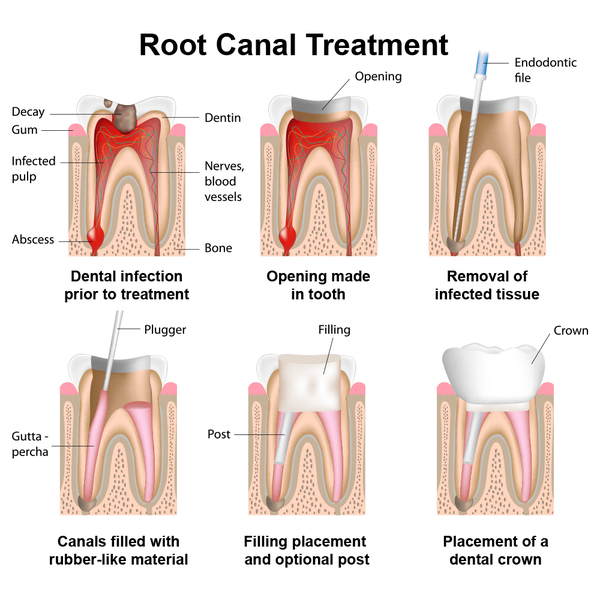 The benefits of root canal therapy include restored dental function and an effective treatment covered by insurance. There are six basic steps involved in a root canal. Once the infection reaches the inner pulp chamber, the only way to save the tooth is through an extraction or root canal therapy. Although an extraction is immediate and a more affordable option, it can require additional costly restorative procedures in the future to replace the missing tooth. Treating an infected tooth with a root canal procedure preserves the natural tooth and is less invasive than a tooth extraction. If you are anxious about undergoing root canal therapy, Dr. Van Slate also offers nitrous and oral conscious sedation to make treatment more comfortable. As an added benefit, most insurance companies cover at least a portion of the procedure, and we also provide CareCredit and LendingClub financing to help make treatment more affordable. Root canal therapy gives you instant relief from dental pain and sensitivity so you can once again enjoy eating all your favorite foods. In addition, it can also protect your overall health. With this procedure, you can restore the structural integrity of your tooth and avoid the need for an extraction. Just one missing tooth can place the surrounding teeth and bone at risk. Tooth loss can lead to dental misalignment, jawbone deterioration, and even facial structural changes. Your oral health has a direct impact on your overall physical health. By delaying dental care when a toothache occurs, the infection can spread to other parts of your body. Tooth decay and infection can lead to diabetes, heart disease, and other serious conditions. Dr. Van Slate can repair your beautiful smile with root canal therapy. If you are interested in learning more about the benefits of root canal therapy, contact our office online today or call (713) 783-1993 to schedule your consultation with Dr. Van Slate.